Of course I use canned beans. They’re a fantastic convenience and as far as health is concerned, they are just as good for you as homemade, with the one distinction being sodium content. But scratch made beans — meaning cooked beans that started as dried — taste better and have superior texture. Cup for cup, they also cost less, and as an added bonus for us city-dwelling schleppers, dried beans are not as heavy to lug home from the grocery store. You can subtract the weight of the can and the cooking liquid. I know, but these are factors Brooklynites consider when it comes to making foods like beans and stock. And since making beans from scratch is so simple and only requires a little advanced planning, water and a pot, why not? Go ahead, give your can opener a rest. 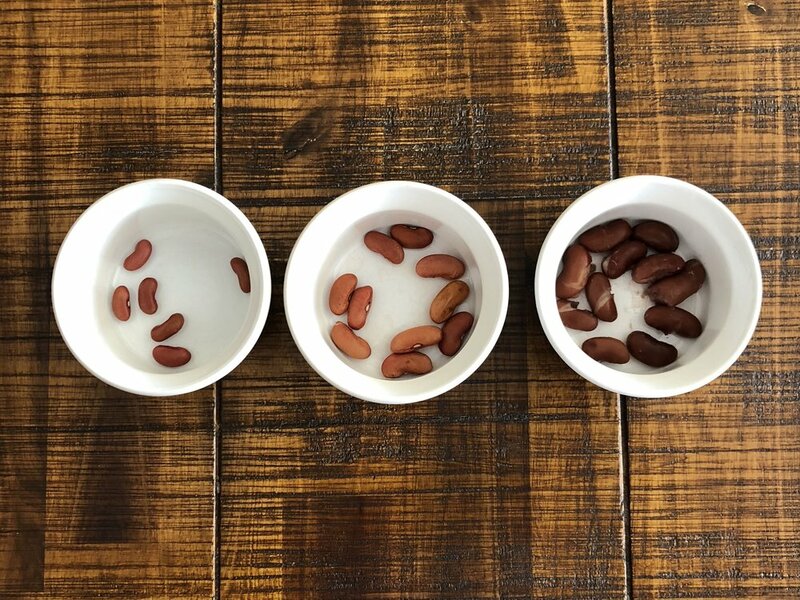 Soak beans overnight in cool water. Refrigerating optional. Drain, discard soaking liquid and rinse. Soaking beans is essential. You will reduce cooking time, help them cook more evenly, and make them more digestible, eliminating the gassy effects many people experience with beans. Soak most beans for a minimum of 6 hours or overnight. If you’ll be soaking them longer than that (whoops, no time to cook them! ), then give them fresh water, transfer to the fridge if they were out, and use within 2 days max. The idea is to get them to double in size after soaking. See image below. 1. The beans on the left are dried. 2. The beans in the middle were soaked overnight. 3. The beans on the right were pressure cooked for 5 minutes. Adding salt at the beginning of the cooking process will make them more flavorful and more tender and will reduce the amount of salt you use in the dish later. Use 1/4 teaspoon to 1 cup DRIED beans (before soaking). There is much debate about salting beans during cooking. If you’re interested, read up here and here. So long as beans soaked before hand (and do not salt the soaking liquid), they will be soft enough to absorb salt from the cooking liquid and cook evenly from the beginning of the cooking process. Use spices in bean dishes to help counteract flatulence. I told you that if you cook beans correctly, starting with soaking and finishing with seasoning, you can control how they are digested. Some spices that relieve flatulence include: cardamom, cinnamon, ginger, cumin, black pepper, cloves, allspice, and fennel. Bay leaf helps to tenderize the beans and also aids digestion. Water should just cover the beans in a pressure cooker or go twice as high as beans in a conventional pot. In the latter, add more liquid as needed while beans are cooking. Pressure cookers (or those instant pots everyone has now) are great for cooking beans in a fraction of the time. See chart below. To use: seal lid, turn burner on high and bring to pressure (when pin pops up and hisses), reduce heat to low and set timer for lower end of estimated cooking time. At time, remove pressure cooker from heat and allow pressure to release on its own (pin pops down). Check beans, taste and repeat in 1-2 minute increments as needed. In a conventional pot, bring water to a boil with beans, bay leaf and salt. Reduce heat to medium and gently cook until beans are tender. your personal preference and intended use of the bean: Do you like it softer or with a little firmness or chew? Do you want the beans to be creamy for a puree or stew or firm for use in a salad or pasta dish?